Tanna of the second generation (first century C.E.). Being first among the disciples of R. Johanan ben Zakkai (Ab. ii. 8; Ab. R. N. xiv. 3), he delighted his master with his wisdom and penetration, so that the most extravagant encomiums were lavished upon him. It was said, "Were all the sages of Israel placed in one scale, and Eleazar b. 'Arak in the other, he would outweigh them all" (Ab.l. c.; Ab. R. N. xiv. 4), while his great master styled him "Rising Well" or "Gushing Stream" ( , ib.). The master once propounded the question, "Which acquisitionis best for man to strive after?" Several solutions were handed in, among them one from Eleazar, who suggested, "A good heart" ( ); thereupon Johanan remarked, "I prefer Eleazar's solution to all of yours, since yours are included in his" (Ab. ii. 9; Ab. R. N. xiv. 5). Again, the master propounded, "Which is the worst characteristic that man should shun?" 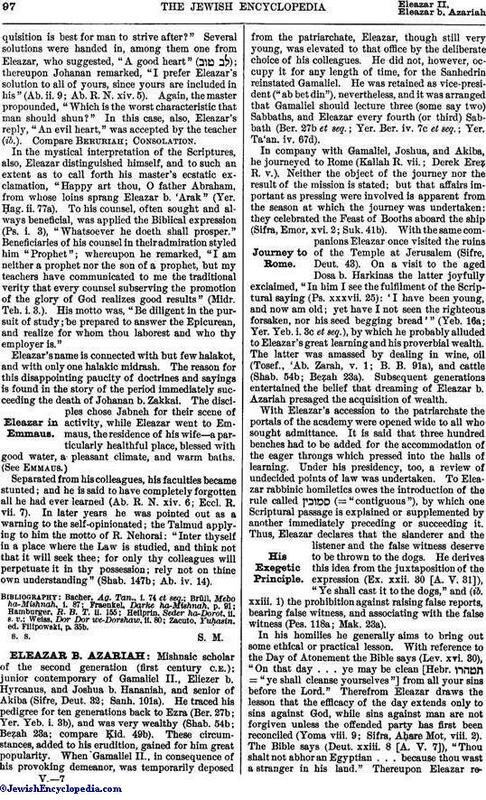 In this case, also, Eleazar's reply, "An evil heart," was accepted by the teacher (ib.). Compare Beruriah; Consolation. 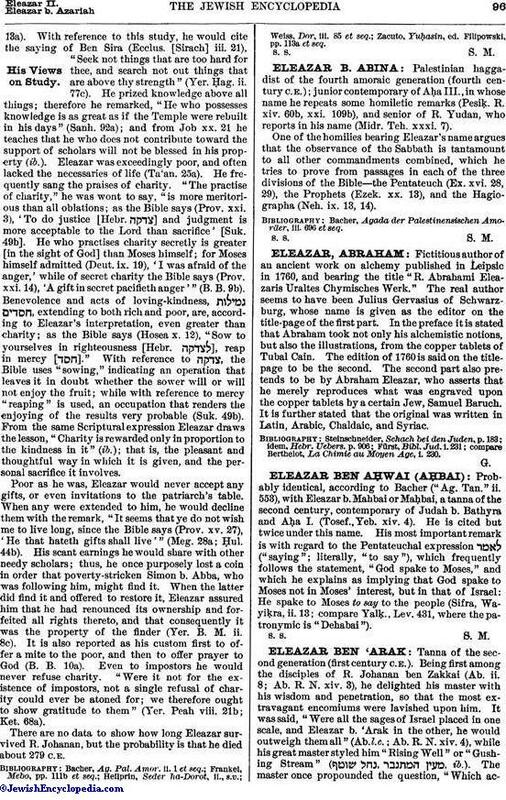 In the mystical interpretation of the Scriptures, also, Eleazar distinguished himself, and to such an extent as to call forth his master's ecstatic exclamation, "Happy art thou, O father Abraham, from whose loins sprang Eleazar b. 'Arak" (Yer. Ḥag. ii. 77a). To his counsel, often sought and always beneficial, was applied the Biblical expression (Ps. i. 3), "Whatsoever he doeth shall prosper." Beneficiaries of his counsel in their admiration styled him "Prophet"; whereupon he remarked, "I am neither a prophet nor the son of a prophet, but my teachers have communicated to me the traditional verity that every counsel subserving the promotion of the glory of God realizes good results" (Midr. Teh. i. 3.). His motto was, "Be diligent in the pursuit of study; be prepared to answer the Epicurean, and realize for whom thou laborest and who thy employer is." Separated from his colleagues, his faculties became stunted; and he is said to have completely forgotten all he had ever learned (Ab. R. N. xiv. 6; Eccl. R. vii. 7). In later years he was pointed out as a warning to the self-opinionated; the Talmud applying to him the motto of R. Nehorai: "Inter thyself in a place where the Law is studied, and think not that it will seek thee; for only thy colleagues will perpetuate it in thy possession; rely not on thine own understanding" (Shab. 147b; Ab. iv. 14). Zacuto, Yuḥasin. ed. Filipowski, p. 35b.